How to quantify the financial impact of proposed changes in an S&T? 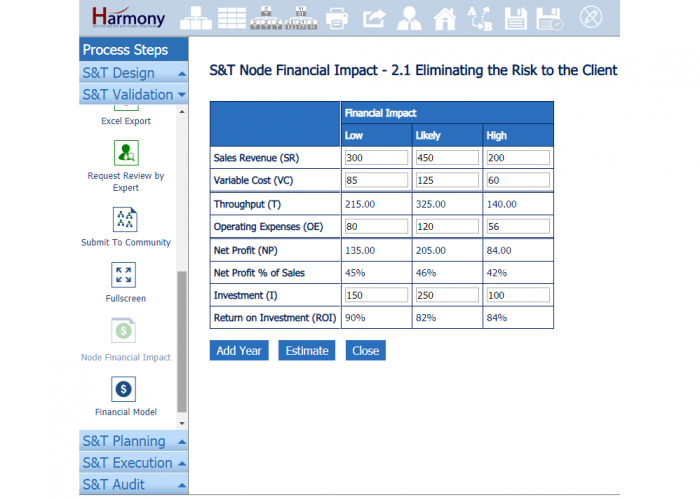 Harmony offers 2 important ways to quantify the impact of your change – the overall financial model and a financial impact by a node. 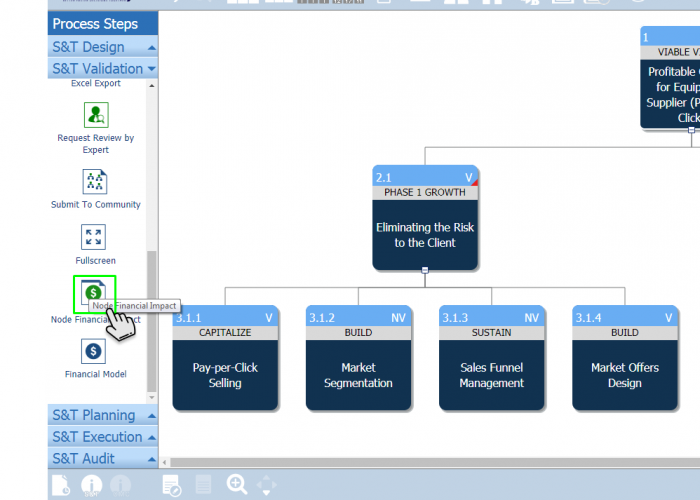 Using the left-hand menu, open the ‘S&T Validation’ menu and click on ‘Financial Model’. User can update the values as per their requirements. User can export to Excel, click “Close” to return to your S&T tree. 1. 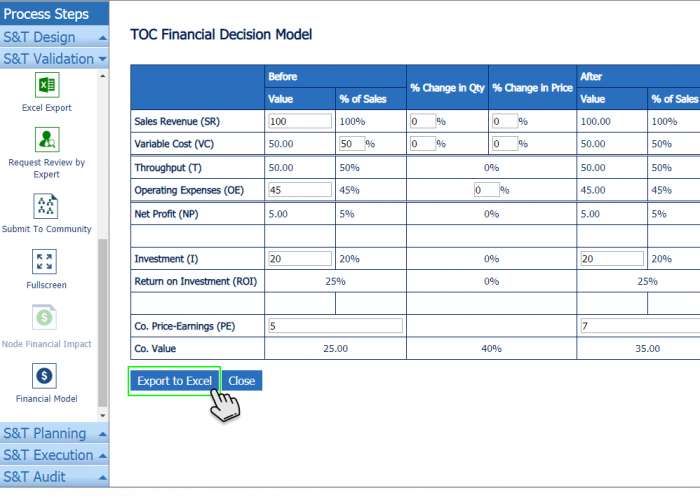 Using the left-hand menu, open the 'S&T Validation' menu and click on 'Financial Model'. 2. User can update the values as per their requirements. 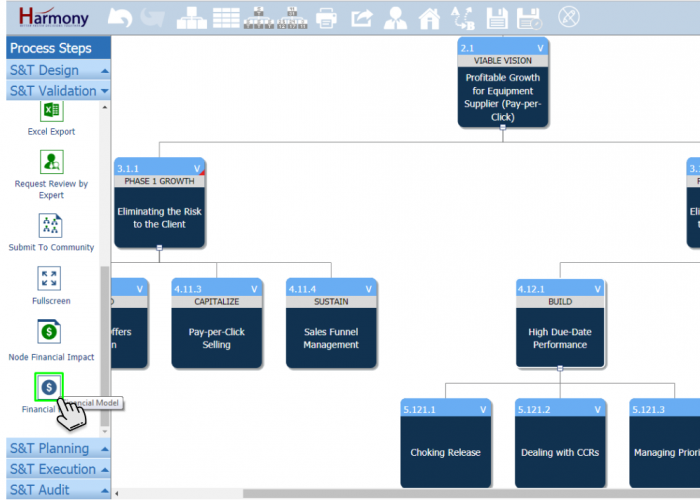 User can export to Excel, click "Close" to return to your S&T tree. Using the left-hand menu, open the ‘S&T Validation’ menu and click on ‘Node Financial Impact’. Use can add “Low”, “Likely” and “High” as their requirement. User can also add year by clicking on “Add Year” button. ‘Estimate’ link for any node with children where financial impact is entered. 1. Using the left-hand menu, open the 'S&T Validation' menu and click on 'Node Financial Impact'. 2. Use can add "Low", "Likely" and "High" as their requirement. User can also add year by clicking on "Add Year" button. 'Estimate' link for any node with children where financial impact is entered.